There are multiple scenes that take place during the beginning of the credits. First we see the cast singing and dancing to the song “Put a Little Love in Your Heart”. We then see Frank Cross/Bill Murray come up to the camera and encourage the audience to join in the singing. Those scenes end with James Cross saying “My brother, the king of Christmas”. 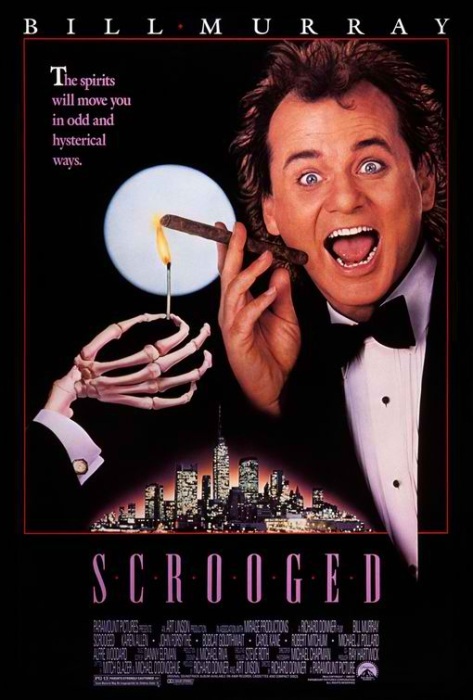 And just before the rolling credits begin, we see Bill Murray appear behind the word “Scrooged”. He then proceeds to “wipe” the letters off of him.